A worthwhile detour between Paris and Brussels leads to Lille, the largest city in French Flanders - the region of northern France that borders Belgium. 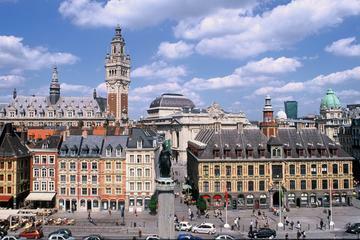 Lille is the historic capital of Flanders, which only became part of France in 1713 under the Treaty of Utrecht. The Flemish influence is seen in the city's elegant Flemish Baroque architecture and hearty cuisine. Lilloise gastronomy incorporates typical Belgian dishes such as "moules-frites" (mussels and French fries) as well as unique local specialties like "waterzoï" (fish or poultry in cream sauce with vegetables) and "potjevleesch" (potted meat terrine). Visitors will also enjoy wandering the charming pedestrian streets and seeing the cultural attractions. A world-class fine arts museum, the avant-garde cathedral, and Charles de Gaulle's birthplace are among the highlights. With its interesting sights, pleasant city center, and friendly atmosphere, Lille is a vibrant urban destination without any pretensions. The bustling main square of Lille, the Place du Général de Gaulle is surrounded by stately Renaissance and Baroque Flemish buildings with Neoclassical facades. 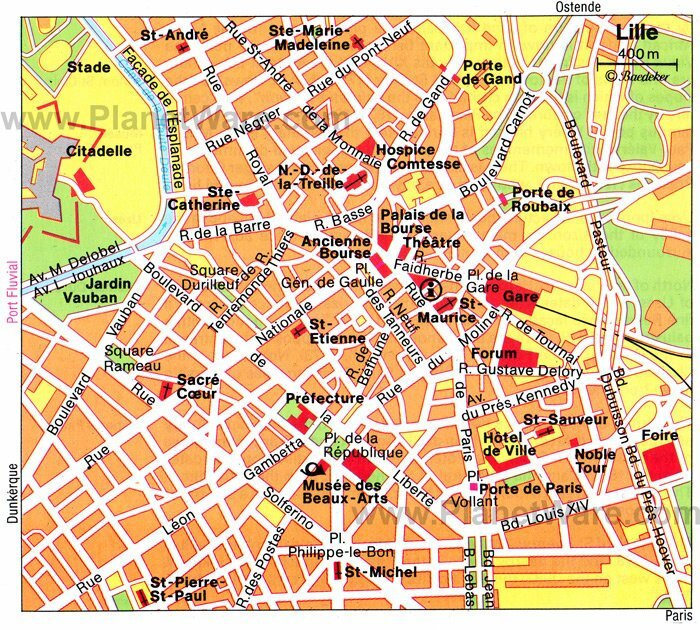 Also known as the Grand Place, the square is a favorite meeting place for Lillois. This center of social activity is filled with cafés and brasseries. In the middle of the square, the Goddess monument commemorates Lille's resistance to the Austrian siege of September 1792. At the top of the column, the bronze Goddess holds in her right hand a linstock used to light the fuses on cannons. An engraved inscription on the base of the column reads: "The courageous response of the Mayor of Lille, André, who refused to surrender the besieged city." The Goddess was sculpted in 1845 by Théophile Bra, who also created bas-reliefs on the Arc de Triomphe in Paris. On the south side of the square is one of Lille's most beautiful buildings, the Vieille Bourse (Old Stock Exchange), which was established in 1652. The Vieille Bourse is 24 houses that surround an arcaded courtyard. Exemplifying ornate Flemish Baroque style, the courtyard features a monument to Napoleon I at the center and is a hub of city life, where locals can be seen playing games of chess and shopping for tomes at the secondhand book market. Also found on the Place du Général de Gaulle is the Grand Garde, former housing for sentry guard soldiers, that was converted to the Théâtre du Nord. One of the essential things to do in Lille is visit the Palais Beaux-Arts, considered the second most important museum in France after the Louvre. Renowned for its size and quality, this prestigious art collection is housed in an impressive building with a spacious and bright atrium. The collection includes masterpieces of European painting by Rubens, Van Dyck, Goya, and Delacroix. There are also wonderful examples of 19th-century French painting, as well as Impressionist art, including Claude Monet's House of Parliament, London, and modern art such as Picasso's Olga in Fur Collar. Other highlights are the antiquities collection and a sculpture gallery with pieces by Rodin and other artists. Those who appreciate military history will enjoy the 18th-century relief maps of fortified towns in Northern France and Belgium (which were used by French Kings during wars). The Musée Louvre-Lens is a sleek modern museum located in a park that was formerly a coal mining site. The Louvre-Lens Museum boasts a rotating exhibit of artworks (exhibitions are updated on a regular basis) from the Louvre Museum in Paris and has become a prestigious cultural attraction in the Nord-Pas-de-Calais region. The Grande Galerie of the museum is a spectacular 3,000-square-meter space that displays artworks in a novel way, without being separated into rooms. The Galerie du Temps presents a chronological exhibition of more than 200 Louvre artworks from different periods of history: Antiquity, Middle Ages, and the Modern Era. This world-class museum is a worthwhile excursion from Lille that takes about 30 minutes by car or 40 minutes to one hour by train (depending on the departing station in Lille). There is a regular shuttle bus service from the Lens train station to the Louvre-Lens Museum. About 12 kilometers northeast (a 20-minute drive) of Lille is Villeneuve d'Ascq, renowned for this prestigious museum in a lush setting. One of the most important museums of 20th-century and 21st-century art in northern Europe, this is the only museum in France to gather such a comprehensive collection of modern art. The museum displays more than 4,500 works in 4,000 square meters of exhibition space, plus the garden area that displays sculptures. The exhibits include works by Braque, Kandinsky, Klee, Miró, Modigliani, and Picasso. The museum owes its collection to a donation from the Masurel family, and the museum founders were among the leading private collectors of Cubist art in France. In the heart of the old town, the Musée de l'Hospice Comtesse occupies a medieval hospital founded in 1237 by the Countess Jeanne de Flandre. The countess built the hospital in a wing of her own palace, which was later used by Augustine nuns. The hospital remained in service until 1939, and the property was converted to a museum in 1962. The museum grounds include buildings dating to the 15th through 18th centuries: the old hospital ward, convent buildings, and a chapel that belonged to nuns. The buildings are arranged around two courtyards and a garden where medicinal plants were grown. A visit to this museum allows tourists to admire a collection of tapestries, sculptures, and porcelain from the 17th-century Flemish convent. The Eglise Saint-Maurice is a beautiful Gothic church that was founded in the 14th century. The church has been renovated several times, as recently as the 19th century, yet has retained a sense of architectural unity. With its tower on the facade, the building is an example of an "Hallekerque" (barn-like church), a type of structure adapted to the fragile, marshy soil of Flanders. The Saint-Maurice Church is also distinguished by its harmonious interior featuring five aisles and 36 tall columns. The sanctuary is decorated with 17th- and 18th-century paintings by Lille artists. In one of the chapels, there is an interesting 16th-century statue that depicts "Christ's Scourging." The central chapel is devoted to Sainte Barbe, patroness of Lille artillerymen who defended the town. During the French Revolution, the church became known as a "Temple of Reason." Another interesting church nearby is the Eglise Sainte-Catherine on Rue Royale, which is lined by lovely historical buildings. This 15th-century Gothic church boasts an exceptional painting, the Martyrdom of Saint Catherine by Rubens, in the north aisle. At the other end of Rue Royale is the Eglise Saint-André, an 18th-century church built for the Order of Carmelites. The elegant 17th-century buildings of the Rang du Beauregard stand resplendent on the Place du Théâtre opposite the Vieille Bourse. The row of houses was created in 1687 by Simon Vollant based on guidelines from the City Council of Lille to achieve uniformity of architecture in the city center. The buildings were required to conform to specific design standards aligning with the Vieille Bourse. Builders had to follow a blueprint of three floors with an attic above and were only allowed to use stone and brick. The buildings feature simple classical lines with decorative cartouches such as scrolls, cornucopias, and angels. The Rang du Beauregard exemplifies Lilloise Neoclassical Baroque style and is intertwined with the history of Lille. In the facades are cannonballs from the 1792 Siege of Lille by the Austrians. Built in 1854, the Cathédrale Notre-Dame de la Treille is a Neo-Gothic structure with surprising details. The cathedral stands on a site that in the Middle Ages provided shelter for an ancient statue of the Virgin Mary, considered to have miraculous powers. The statue was protected by an iron trellis, which explains the cathedral's name "Notre-Dame de la Treille" ("Our Lady of the Trellis"). Unique in architectural style, the relatively modern cathedral was designed by architect Pierre-Louis Carlier in collaboration with Peter Rice, the engineer for the Sydney Opera House and the Pompidou Centre in Paris. Initially, the church was planned to be a massive size of 132 meters long, with spires reaching higher than 115 meters. However, financial difficulties (because of wars) limited the scale of the project. The cathedral was finally completed in the 1990s and inaugurated in 1999. The most remarkable feature of the building is its translucent "veil," a metal structure that covers the central section of the cathedral, giving the sanctuary an orange-pink glow. Inside are stunning stained-glass windows and a collection of spiritual paintings. A short stroll north of the cathedral is the Eglise Sainte-Marie-Madeleine. Built in 1675, this church boasts an attractive Baroque design and an impressive 50-meter high dome; the facade dates from 1884. One of France's greatest statesmen, Charles de Gaulle was born in Lille on November 22, 1890 and baptized at the nearby Saint-André Church. His birthplace and childhood home on 9 Rue Princess is listed as a Historic Monument. The home has been restored and converted into a museum. Visitors can tour the home to view a collection of family mementos and other personal items including Charles de Gaulle's cradle, his christening robe, and a Saint-Cyr sword from his youth. A multimedia center provides a historic overview of Charles de Gaulle's life and accomplishments. The biggest flea market in Europe, the Grande Braderie de Lille is held every year during the first weekend of September. The "braderie" (French for "low-price sale") event begins at 2pm on Saturday. More than 10,000 exhibitors sell their wares at open-air market stalls placed throughout the city. Items for sale include books, old records, vintage porcelain, antique silverware, clothing, jewelry, artisan crafts, and artwork. This lively event feels more like a festival than a flea market; it draws huge crowds and features a food and drink fair plus a carnival. Tourists will enjoy the local street food, including mussels, French fries, grilled fish, and other regional specialties. This exceptional museum is housed in an unexpected venue-the former Art Déco swimming baths in Roubaix, 14 kilometers from Lille. The swimming baths (no longer used for swimming) provide a unique setting for the museum's collection. A few examples of Picasso ceramics and an interesting display of 19th- and 20th-century sculptures encircle the decorative pool, while galleries of art on three floors display collections of textiles, drawings, clothing, and accessories. After viewing the artwork, visitors may relax in the garden and enjoy a casual meal at the restaurant, which features indoor seating and an outdoor terrace. The museum's boutique offers a selection of books, postcards, games, and jewelry. Luxury Hotels: A block from Grand Place is Best Western Premier Why Hotel, whose large rooms have balconies and coffee/tea makers. South of the center, near the Beaux-Arts museum, L'Hermitage Gantois Autograph Collection has a glass-covered courtyard connecting its several buildings, which include a 15th-century church. Stylishly decorated rooms at Novotel Lille Centre Grand Place are close to Grand Place and the restaurants and shopping of Vieux-Lille. Mid-Range Hotels: Midway between Grand Place and the rail station, Ibis Styles Lille Centre Grand Place includes breakfast. Some rooms at Grand Hotel Bellevue overlook Grand Place, and all are furnished in the classic elegance of a grand hotel. South of the center, close to the Beaux-Arts museum and an easy walk to Grand Place and Vieux-Lille, Holiday Inn Express Lille Centre offers free breakfast and secure underground parking. Budget Hotels: On a pedestrian street between Grand Place and the art museum, the friendly Kanai Hotel has many stairs and no lift. In a lovely residential neighborhood on a tram line into central Lille, family-run Hotel du Croise includes breakfast and secure parking with its rooms, which are all on the ground floor with terrace access. In Vieux-Lille near the Musée de l'Hospice Comtesse, Ibis Budget Lille Centre has well-kept, basic rooms. Bus Tour: For an easy way to experience the top attractions in the city, sign up for the Lille City Sightseeing Tour. This 75-minute tour takes you to see the highlights of Lille by minibus, including the town hall, the Grand Place, and the old town. Along the way, you can learn key facts about the city from the informative audio-visual guide. 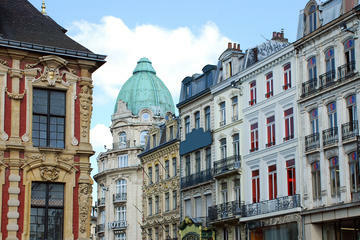 Walking Tour: If you prefer to explore the city on foot, the Small Group Guided Tour of Old Lille is an excellent option. Accompanied by an expert guide, you'll see the top sites of the quaint historic district, including the Cathédrale Notre-Dame de la Treille, which ends near the Hospice Comtesse. For many tourists, a visit to Lille is taken as a day trip from Paris or as a detour on the way to Brussels (90 minutes away by train or car), the capital city of Belgium. Lille could also be incorporated into various vacation itineraries, such as a tour of Belgium's highlights: The picturesque old city of Ghent is just over an hour away by train; the dreamy medieval city of Bruges is two hours away by train; and bustling Antwerp, rich in culture and history, is also just over two hours away by train. Within France, the peaceful countryside and historic attractions of the Champagne region are easily accessible from Lille in less than two hours by train or car. The lively city of Amiens, in France's Picardy region, is less touristy but worth the trip (about 90 minutes by train or car).